There are simply so many chia seeds health benefits that it was seriously tough choosing just a few for this article. Chia seeds are one of the world’s oldest nutritious foods, documented as early as 3500 BC. This means we’re looking at over 5500 years of usage of chia seeds from people all over the world. If this doesn’t impress you, then the list that follows and all its amazing health benefits surely will. Chia seeds are tiny seeds, black in color, coming from the plant called Salvia Hispanica, a relative of the much more common mint. The plant calls South America home, but it can be cultivated in other parts of the world as well. It used to be quite a culinary staple for the famous Aztecs and Mayans, who revered it for its high nutritional value. As a matter of fact, the term ‘chia’ itself means ‘strength’ in the ancient Mayan language. When fed to soldiers, it gave them endless supplies of energy and kept them going far longer than they would normally have done. However, despite the fact that Chia has a 5500-year history, as previously mentioned, the world only rediscovered it in the past few years. But we’ve more than made up for our lack of interest in the small chia seeds and the chia seeds health benefits because we now call them a ‘superfood’. Why? Because they pack a strong punch. Here is what that punch is made of. Apart from these excellent ingredients, chia seeds also have zinc, potassium, and Vitamins B1, B2, and B3. All of these goodies are packed tightly in one single ounce of the lovely seeds. The same amount has only 137 calories and one single gram of carbs. 1 ounce means 28 grams of chia seeds. Therefore, imagine what chia seeds health benefits you will be getting from such an amount of material! When doing the math, researchers found that these proportions per ounce transform chia seeds into the best source of multiple crucial nutrients in the world, calorie per calorie. As if that wasn’t enough, almost all chia productions are organic, it’s considered a ‘whole-food’, and it’s naturally free of gluten. What Are the Chia Seeds Health Benefits You Should Be Aware of? All that being said, here are the main chia seeds health benefits. As mentioned above, one ounce or 28 grams of chia seeds has just one single gram of carbs. This translates into the fact that, if you want to go on a low-carb diet to lose some weight, say hello to your new little friend. Apart from this, but still related to the low-carb diet, chia seeds are very high in proteins. As you, probably, already know, any food with a high protein value will make you feel satiated for a lot longer than other foods. When you feel full for longer amounts of time after an important meal, you cut back on snacking and over-eating. The result? You lose weight. All in a natural, safe and healthy way. Another positive result of the fact that chia seeds are so rich in protein is that they will help with your bowel movements. The protein feeds the bacteria naturally found in the intestine and allows them to thrive. In response, they will feed your body with plenty of nutrients and essential compounds meant to stimulate your immune system and overall health. A good, healthy, and regulated bowel movement system is an absolute must, given that the food we regularly eat is processed and has a lot of sugar and salt in it. Looking at it this way, these chia seeds health benefits are an absolute must. Again taken gram for gram, chia seeds actually pack more calcium than almost all the dairy products available on the market. One single ounce of chia seeds contains 18% of the recommended daily dosage of calcium for an average adult. However, bone health via chia seeds doesn’t stop at calcium. Some other chia seeds health benefits include them being rich in phosphorus and magnesium. They too help your bones and make sure they stay strong and healthy. How many times did you go on special diets or juice fasts just to detoxify your body? If you’re like the average Joe out there, probably many times. That’s because you didn’t know about the existence of chia seeds or chia seeds health benefits when it comes to detox. Since chia seeds come from the plant with the highest combination of omega-3, fiber, and protein in the world, they will aid you greatly in your detox efforts. That’s because they support the body’s natural pathways of detoxifying itself, they repair damaged cells, and convince your digestive system to go on a marathon. You’ve guessed it, among other chia seeds health benefits you can also find beautifying tricks. Chia seeds have a blend of nutrients that help your hair, skin, and nails. The healthy fats, the protein, and minerals, such as the excellent zinc, will work their magic on your body, making it beautiful as well as healthy. Believe it or not, it’s true. Chia seeds are a perfect replacement for eggs. Their outer layer swells up when you mix chia seeds with different liquids and turns into a gel. It looks and has about the same consistency as egg white so that you can use it safely in all your cooking and baking. It’s an important thing to know, especially if you are not allowed to eat eggs for medical reasons, if you are on a diet or if you are planning on reducing your cholesterol levels. To make this one-of-a-kind replacement for eggs, all you have to do is add one tablespoon of chia seeds to 3 tablespoons of water and let them sit for 15 minutes. Vegan eggs in a heartbeat! Another one of the great chia seeds health benefits is the fact that these little black goodies help control the sugar levels in your blood. They reduce your body’s resistance to insulin and decrease the abnormally high concentrations in the blood. One more reason for starting to eat chia seeds right away! Dyslipidemia is an imbalance of lipids in the blood. It usually refers to cholesterol. That’s why it’s also called hypercholesterolemia. No matter what it’s called, it’s a pestering ailment you can easily get rid of if you eat a few chia seeds. The ‘British Journal of Nutrition’ published a study which showed that one of chia seeds health benefits is that they lower triglycerides and the dreaded cholesterol. At the same time, they increase the good cholesterol, otherwise known as HDL. The study goes on to say that its researchers also found that, when replacing other fat and oil sources, such as corn oil with chia seeds, the ALA actually prevented the levels of triglycerides to rise, and it reduced central obesity. The main reason why chia seeds have this effect on our bodies is that they represent a great source of healthy dietary fat for us, much like avocados, for example. Last on our list of chia seeds health benefits is the effect they had on type 2 diabetes. It’s no accident this is last on the list because it’s considered to be the biggest breakthrough regarding chia seeds of all. A study on type 2 diabetes was performed. 20 patients suffering from this disease were given 37 grams of chia seeds or 37 grams of wheat bran for 12 weeks in a row. The study group that received chia seeds instead of bran saw significant improvements. For example, their blood pressure went down by 3-6 mm/Hg. The hs-CRP inflammatory marker went down as well, by a staggering 40%. The risk factor called vWF also went down by 21%, as well as the patients’ sugar levels in the blood, although much less significant than the other markers. Now that you saw how many chia seeds health benefits there really are, you have probably decided to give chia seeds a go for yourself. Here are some great ways in which you can include them in your daily diet. 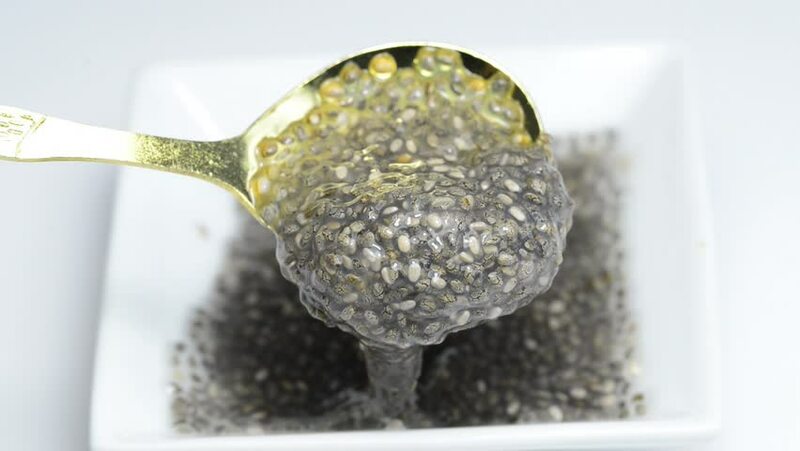 When you soak chia seeds in water or any other liquid, for that matter, they gather the consistency of tapioca. If you add some natural sweeteners, such as stevia or honey and some spices, such as cinnamon, poppy seeds, cardamom, nutmeg, or ginger, you’ve got yourself a full-blown dessert. If you like your sweet treats to have a bit if a crunch, add some crushed almonds on top. The best thing about this recipe is that it can be eaten day in and day out because it has almost no calories at all. The only things you’ll need are some chia seeds, of course, almond milk to soak them in, honey, a bit of salt, and whatever spices you feel like adding. You can also throw in a dash of cocoa for a chocolaty guilt-free and completely healthy dessert. The amazing thing about chia seeds, apart from all the chia seeds health benefits is that you can literally add them to anything you want. From yogurt to smoothies, to applesauce, these little seeds just make everything better. Cooking tip: always remember chia seeds absorb any liquid they come in contact with and transform it in a viscous paste. Therefore, they might spoil cake and cookies you need to be crunchy, for example. It’s mostly preferred you make your own snacks at home when using ingredients such as chia seeds and when you’re trying to lose weight or eat as healthy as you can. However, there are special mixes you can buy right off the shelf that include the precious chia seeds. Think of them as much healthier trail mixes. However, make sure to check the sugar level on the little packets before you buy them. They usually have a lot of processed sugar added to them to make them tastier for the general buying public. If that is the case, make your chia-mix right at home. Add some raw cashew, almonds, and a handful of sultanas for some sweetness and watch your day get healthier and brighter. Given the fact that it becomes gelatinous in texture when combined with a liquid, chia can be used as a fantastic spread base. For example, you can use it to make jam without the added pectin. Blend the chia seeds with whatever fruits you want, add some stevia or honey and you’ve just made the healthiest jam in the world. The best part is that, unlike traditional jam, you can have as much of this one as you want because it’s not fattening at all. The chia seeds health benefits don’t stop at food and desserts. You can also make your personal brand of hygiene products using it. Mix ¼ cup of coconut oil with one teaspoon lemon juice and one tablespoon of chia seeds and you’ve created an excellent face scrub with things you already had in your kitchen cupboard. For 5500 years, mankind has been making use of the amazing chia seeds health benefits. It’s high-time you started, too!